Actual miles! Very clean truck, will not find another with these low miles! Recent Arrival! Red Clearcoat 2001 Ford F-250SD ***ANOTHER S & B 1-OWNER VEHICLE***, F-250 SuperDuty XL, 2D Standard Cab, Power Stroke 7.3L V8 DI 16V OHV Turbodiesel, 4-Speed Automatic, 4WD, Red Clearcoat, 4-Wheel ABS Brakes, ABS brakes, Trailer Tow Package. 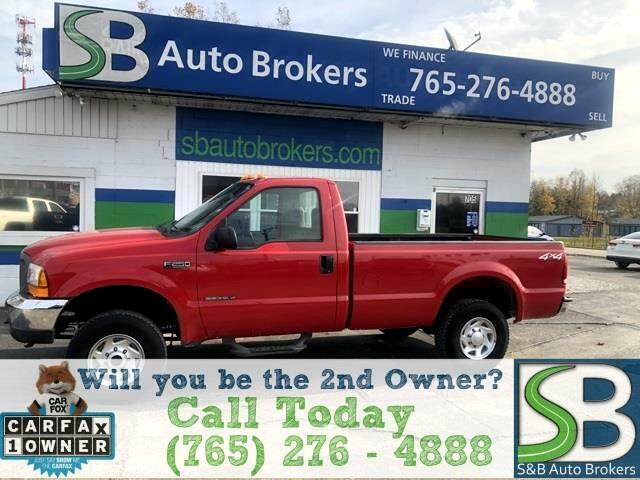 Visit S & B Auto Brokers online at www.sbautobrokers.com to see more pictures of this vehicle or call us at 765-276-4888 (Greencastle) today to schedule your test drive. Thank you for visiting S&B Auto Brokers where we strive to provide the customer the best possible car shopping experience. MOST OF OUR VEHICLES ARE LATE MODEL WITH A CLEAN CAR FAX. ALL ARE INSPECTED, SERVICED AND RECONDITIONED, MOST OF OUR VEHICLES ARE COVERED WITH THE MANUFACTURER WARRANTY OR A 3 MONTHS/3000 MILE DRIVE TRAIN WARRANTY. FINANCING IS AVAILABLE THROUGH A VARIETY OF BANKS AND TRADES ARE ALWAYS WELCOMED. PLEASE KNOW: Any of our cars listed on the internet may be sold at any time on eBay, other internet sites or at the store by one of our sales people. If you have a strong interest please contact us as soon as you can. These are all pre-owned cars and trucks and as such may have some imperfections. All vehicles are detailed. All vehicles will come with at least 1 key and may or may not have books. Sometimes the cars will be pictured before they are reconditioned to get the ad's running. If you have a question about condition please contact us. S&B Auto Brokers takes pride in maintaining a large selection of fully reconditioned and inspected vehicles. With quality cars, vans, and trucks from local dealer trades, overstocked inventory, off-lease manufacturer auctions, bank repossessions & open auctions, we have the perfect vehicle for you- and your budget. Call, email or visit our website today.